As residents of Northern Virginia and full-time real estate professionals in Virginia since 1998, Bruce and Tina want to introduce themselves and invite you to consider them for your future real estate needs. They offer a long track record of satisfied clients in the Northern Virginia area. Read their 5-star testimonials on Zillow. Tina worked in sales, marketing and management before becoming a real estate agent. s She started her real estate career in New Jersey before moving to Northern Virginia. Bruce, a native of the Virginia/DC area since birth, worked in marketing and sales for a National Association. When he met Tina, he started selling real estate part-time. It was not long before Bruce found his “true-calling" and became a full-time realtor and Bruce and Tina became a team. Above the standard REALTOR designations, Bruce and Tina hold Certified Residential Specialist, Accredited Buyer Representative, Certified Distressed Property Specialist, and Certified Military Residential Specialist designations and were inducted into the RE/MAX “Hall of Fame.” They helped relocate dozens of families moving in and out of the Northern Virginia area and pride themselves on professionalism throughout each transaction. Bruce has been referred to as a man of many talents as he’s not only proficient in his sales/negotiating skills but is an avid and proficient golfer, enjoys singing and playing the guitar, a gourmet cook, also a wine and cigar aficionado! He enjoys sports cars and proudly displays his Shelby Mustang at local car shows. Tina also enjoys playing golf, as does their daughter, Katrina. She enjoys traveling and often tours the sites in the Northern Virginia/DC area when friends and family are visiting. Aside from working side-by-side in their real estate business, Tina stays even busier with Katrina’s ice skating, dance, piano & singing lessons, and as a freshman in high school they will have even more activities. That will not deter Tina, she works all hours of the day and night to keep up with all our seller, buyer, and potential client’s details. They feel fortunate to be living and raising their family in Northern Virginia and for the long-term client-relationships built over the years! 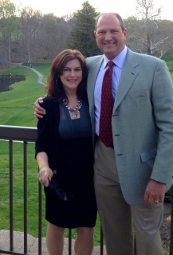 Bruce and Tina are proud to say that over 90% of their business comes from past-client referrals! With Bruce & Tina on your side, they will go above-and beyond. Together they have exceptional marketeting, sales, negotiating skills, and having an “eye for detail." They understand the importance of “staging the home” and pricing it properly. They fully understand the complexities which go along with listing a home for sale. Whether It’s “winning the contract” or a home purchase or solidifying an offer coming in on your home – you are in good hands. Bruce and Tina look forward to assisting you, a neighbor or someone you might know with buying, selling or renting a home!